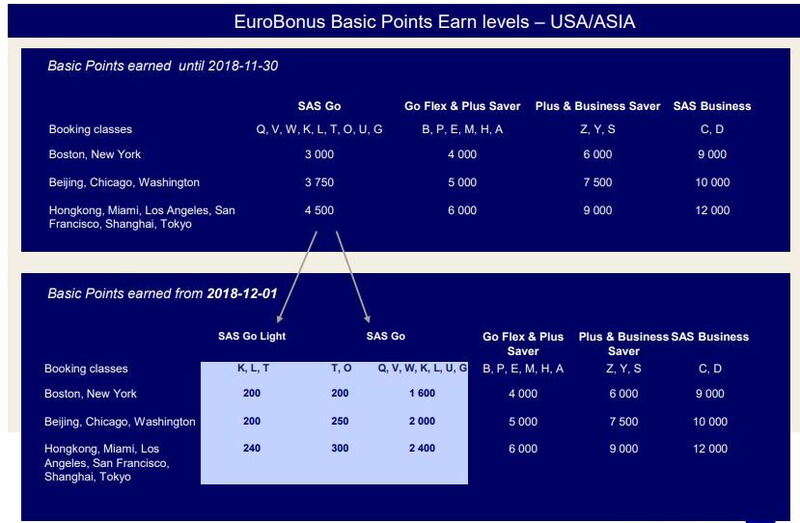 SAS have just reported this morning that the SAS Go earnings of EuroBonus points will be reduced a lot from December 1st 2018. OK. This starts to look so serious to me that it might be worth recalculating whether I wouldn't like to change the airline or my FFP. The first time in a loong time. Sama here. Ridiculous no bags policy for Gold, Diamonds etc and very high baggage fees compared to for example Finnair are also beginning to annoy quite a lot. Also, it's quite hard for normal customers to see what booking class you are buying into. Do we have to start to use travel agencies again?? What's it the strategic reasons for this - other than just cost savings? Each tier threshold must be cut in half. Even more of us must be leaving. This will probably mean, that I will go floating between programs, as I cannot uphold top tier anymore. Might as well just go googling for each flight and then go for cheapest bizz TATL. I am so puzzled and a little frustrated - like being dumped by a girl, almost. SAS is really not loving me. Tango Alpha and zeer0 like this. They really do everything they can to compete on price alone here. To me they are just shooting themselves in the foot, cause if they can't offer the lowest price they won't succeed with the strategy. Also, from a consumer point of view this is ridiculous. A K-fare (Go light) CPH-CHI costs €592 return + €220 YQ + €77 taxes. That is €812 (out of €889) that goes straight to SK pocket and they will in return give you 400 EB-points to spend as you please! In this (I admit pretty theoretical) example you'd earn gold only after having done 22.5 return trips to Chicago, i.e. SAS would give you a gold card only when you've spent €18000 on tickets + YQ, excluding taxes. You would also have earned 9k EB points only. Also, from a consumer point of view this is ridiculous. A K-fare CPH-TYO costs €688 return + €220 YQ + €42 taxes. That is €908 (out of €950) that goes straight to SK pocket and they will in return give you 480 EB-points to spend as you please! In this (I admit pretty theoretical) example you'd earn gold only after having done 22.5 return trips to Tokyo, i.e. SAS would give you a gold card only when you've spent €20500 on tickets + YQ, excluding taxes. You would also have earned 10k EB points only. It is 4800 points and not 480. K earns in future 2400 in Go. And there are no Light tickets to Asia. You are right, thanks! Example updated. This is the tactic I will be seriously considering. What I need is short connections, fast track, lounge access, and minimum acceptable service (which is really low for me, DY would do, FR/EU2 would not) on European shorthaul. I won't be paying flex tickets to get that. Might just go back to whatever these services cost on the day I am flying. Everywhere I fly there is an alternative to SK. Not sure if maintaining status helps any more (for me MM and EB are natural choices, but none of them is particularly attractive). SK might be playing on emotions and attachments here, but for me it is a matter of pure calculation what is the cheapest acceptable service. I don't know yet, if I will be leaving EB, but for the first time it is not obvious for me that I will be staying. Tango Alpha and don_hansen like this. In this (I admit pretty theoretical) example you'd earn gold only after having done 22.5 return trips to Chicago, i.e. SAS would give you a gold card only when you've spent €18000 on tickets + YQ, excluding taxes. You would also have earned 9k EB points only. The rule of thumb for FFPs in Europe is about 12-15k € annual revenue for a Gold customer, so SAS is toeing the line of their consultants here. I'm also curious about whether it will hit A3 earnings on SK too, I'm TK G so I don't really fly SK for points as they give out pretty much nothing anyway. A3 is very generous about miles earn from SK. The devaluation is expected - it's too generous for low priced Y tickets IMO. I am not so sure. I was convinced the previous devaluation (or two) was fine. When SK was paying 1000 points per segment it sounded like too good to be true. Right now, I can see the development like in LH group. I don't find a 2 1 hour legs priced 150 EUR to be dirt cheap, yet they will be earning zero points. The long haul awards in GO are even more of a joke, if I understand the table correctly. It is expected in the sense, that the economy seems to be going good, and they probably experience increased traffic, so they hope to keep the cost level, while increasing profit. A fair perspective. I only wonder whether they are not overplaying it. I think the loyalty to SK in the Scandinavian market is already shaken among professionals. I would say among tourists is long gone. Now they might start loosing a lot of professionals using the airlines frequently. I really hope they calculated this well. My personal decisions are probably not that important here - I will, as usual, find some local optimum for a few years, be it SK or not. But whatever I choose, I would like SK to thrive. Don't like to see the development of it. @SK2751 - Economy doing well IS the problem, that's why a lot of loyalty programmes are doing a lot of "enhancements". They think people can afford more and will fly anyway regardless of miles. Booked SK flights long time ago for a trip next year and I guess I'll have to look at which FFP I should be crediting the flights to. I'm in a similar situation, for flights I would barely scratch at Frequent Traveler with MM, but with a bit of creativity I will be able to receive EBG for the same (this year) (+500-1000 more spent). While I was not flying SAS that often and the times I did, were in Plus only, this is not touching me too much, but all the mileage runs (Youth fares to HKG and back that would give 10k miles for 500 $ that I searched now are not really worth it anymore). This is not exactly ruining, but makins this a lot more difficult, especially for people who are flying SAS a lot. I am so puzzled and a little frustrated - like being dumped by a girl, almost. SAS is really not loving me. don_hansen and zeer0 like this. For EU, it is basically only Lite that changes (and booking class O) taking a hit. For long haul more of a detailed change, but is the table also an admission of Lite coming to Asia flights as well? For EU flights I don't find the changes completely unreasonable. For long haul it seems a step too far. I get worried that partner earnings will also get a hit soon. Abducted Alien and zeer0 like this.